Sixteen years ago, college sweethearts Jeffrey and Julie Glaser found themselves and their two young children in a time of transition. Coming from the glitz and glitter of Las Vegas, Nevada, where the couple lived for a year and a half, they decided to move their budding family to West Hills, California. As much as they liked West Hills, it wasn’t perfect. Both Southern California natives, Jeff and Julie sought a nice suburb that was both beautiful and safe, family-friendly, and close to the beach. They wanted to be away from the hustle and bustle of the San Fernando Valley and Los Angeles, yet still have the amenities of a big city. They dreamed of a tight-knit community with good schools where their two kids could grow up and flourish. 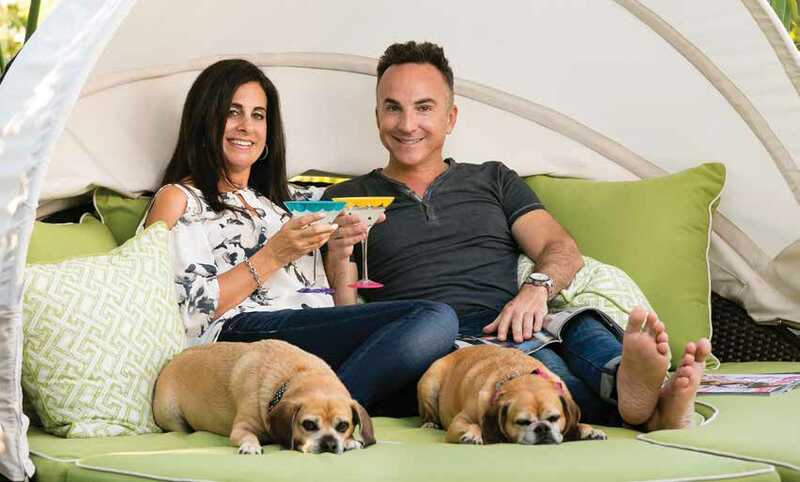 The Glaser family found all of this and more in a beautiful home in The Oaks community of Calabasas, and after nine months in West Hills, Jeff and Julie made their move. Jeff and Julie, both originally from Southern California, attended the University of Arizona for their undergraduate studies. The pair met at the school’s freshman orientation and have been together ever since. After graduation, Jeff, a Granada Hills native, and Julie, from Agoura Hills, moved to Philadelphia to pursue their higher education. With Jeff in medical school at Sidney Kimmel Medical College at Thomas Jefferson University, and Julie at Hahnemann University, now Drexel, they worked tirelessly towards their goals. 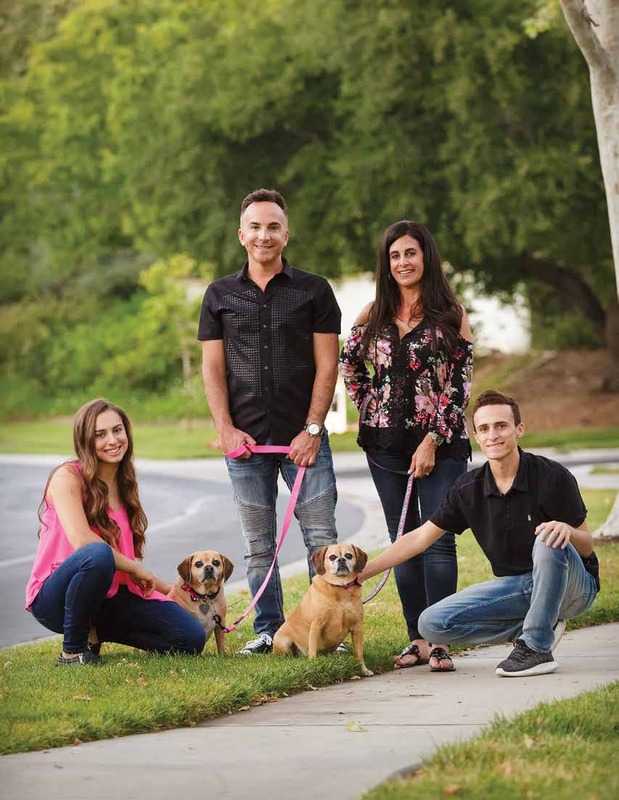 Once Julie received her Master of Physical Therapy degree and Jeff had successfully earned his medical degree, they moved back west so Jeff could complete his anesthesiology residency at UCLA, both with dreams of starting a family in the Southern California sun. Benjamin, the couple’s first child, arrived in 1997. He was followed by his sister, Sara, in 1999. Flash forward 17 years, Dr. Jeffrey Glaser is a UCLA-trained, dual-board-certified physician specializing in interventional pain management and anesthesiology. He is the proud owner of Glaser Pain Relief Center in Encino and has become an expert in nonsurgical treatment of back pain and sciatica. Jeffrey is also a founding partner of multiple surgery centers, including Encino Outpatient Surgery Center and Affinity Surgery Center of Las Vegas. He is blessed to have Conejo Valley resident Suhel Siddiqui as his business partner. The waiting rooms at Jeff’s offices are often a who’s who of the Hollywood “A” list as he caters to the industry’s elite. Julie, a licensed physical therapist, chose to put her practice on hold after working for several years to be a stay-at-home mom for her two growing kids. From Sara’s dance classes to Benjamin’s baseball practice to volunteering at the kids’ school, Julie’s full-time position as mom kept her busy. As her children got older, Julie helped part-time as an office administrator in Jeff’s practice. She is also an independent skincare consultant with Rodan and Fields. Both Ben and Sara have been active in the Calabasas community since an early age. They both attended Bay Laurel Elementary School and A.C. Stelle Middle School in Calabasas. For high school, Ben and Sara attended de Toledo High School, a private Jewish high school in West Hills. At de Toledo, the siblings were met with a very unique opportunity. Both Ben and Sara were able to take part in an exchange program with a school in Israel. Ben spent three weeks in Israel and Sara spent three months in this life-changing program. 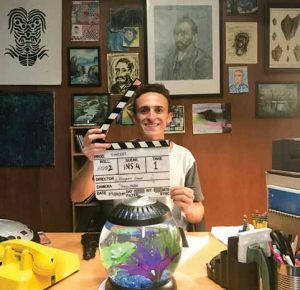 Now 20 years old, Ben is off studying film production – with an emphasis in directing, at the Dodge College of Film and Media Arts at Chapman University in Orange. A junior in the fall, Ben is already putting his minor in business entrepreneurship to work. He and a fellow film student from Chapman formed a production company called Fourth Floor Entertainment. Ben explains that they started with event videography and montages and have since moved on to music videos and short films, with the eventual goal of producing full-length feature films. Sara, now 17, just graduated high school and will be attending Cal Poly San Luis Obispo in the fall. With a business administration major, her true passion lies in her minor: dance. Sara has been dancing since preschool. She studied at Retter’s Academy of Dance and was a member of Rhythm Machine Company for six years. In high school, Sara danced on the varsity dance team for all four years, acting as captain in her senior year. Sara hopes to keep dancing for as long as she can and eventually incorporate her love of dance into her career. As beach seekers, the Glaser family has always loved exploring new places and finding new paradises and beaches to enjoy. They also love to cruise. Some of their favorite travel locations include Puerto Vallarta, the Mediterranean, Israel, and the Caribbean. The night before any air travel, the Glasers always head over to Lovi’s for a delicious dinner. It has become something of a tradition for them. “The staff is so nice, and we always end up bumping into friends from the community,” says Julie. As a family, they also enjoy attending Dodger games, going to the theater, and enjoying their own backyard. This close-knit family is having fun as long as they are hanging out together. 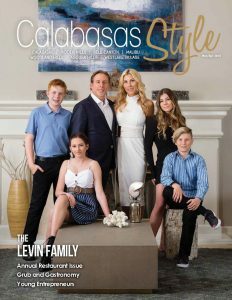 From daily walks around the neighborhood with their two puggles, Fergie and Gracie, to dining al fresco on the patio at Toscanova, the Glaser family enjoys their favorite spots in Calabasas and finding new spots, too. With the youngest Glaser about to leave for college in the fall, Jeff and Julie again find themselves in a time of transition. “The house will be much quieter without the kids, but it is exciting to see them thriving and going on with their adult lives,” admits Julie. Because the Glaser children and their friends have grown up together, many since elementary school, plenty of Jeff and Julie’s friends are going through the same transition, which makes it easier. “We parents have known each other for years because of our kids. We aren’t alone in becoming empty-nesters,” adds Julie. As for Ben and Sara, growing up in Calabasas has definitely helped prepare them to be a part of a community and inspired them to be respectful citizens. They have learned to be good neighbors and, in turn, good friends. “Being a part of a community has allowed them to see how people help and support each other,” says proud mom Julie. Inspired by their love of travel, Jeff and Julie hope to take more trips as their two little birds leave the nest and prepare to fly. They also look forward to dusting off their tennis rackets and getting back out on the court.